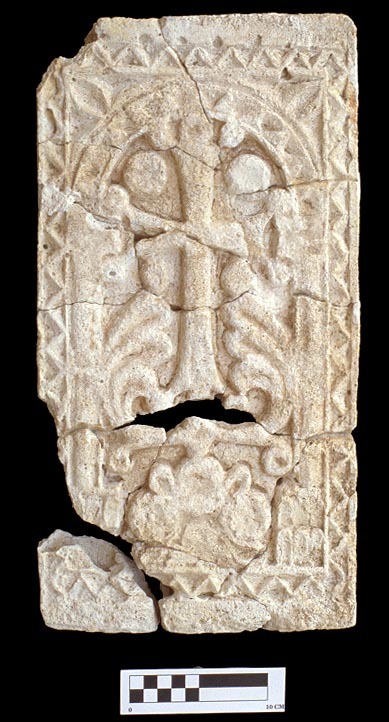 An elaborately carved marble panel was discovered by James Walker in a soil fill (locus 933005) against the north wall of the Beth Kadeshy (Syriac, House of the Souls = Mortuary Chapel). The panels was found at a depth of 100 cm. below the surface. It weighs approximately 4 kg. and measures 25.2 x 20.5 x 5.0 centimeters. The design carved in raised relief on the panel shows three Byzantine style crosses, each mounted on a staff. The central cross is three times larger than the flanking crosses, and a halo or numbus outlines the central cross. Four words, written in estrangleo script are position on each side of the two smaller crosses. The inscription, translated by Archbishop Eustathius Matta Roham (SOC) reads Abad (Syriac, Made by), Dawid (Syriac, David), Habis-shoy (Syriac, Reclusve/Imprisoned Monk), and Slot (Syriac, You [must] pray). 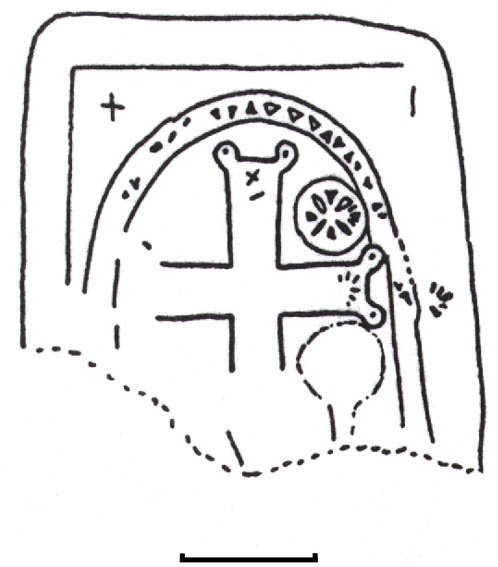 Drawing by David Hanlon of the marble panel found near the entrance of the monastery. Area 9, Square 33, Locus 05. Discovered during the 1998 season at Tell Tuneinir, Syria. Scale is 5 cm. Fragments of a large stucco panel were plowed up by Hadar Selou during Spring of 1995. He was preparing a field on the south edge of the site for planting in wheat. 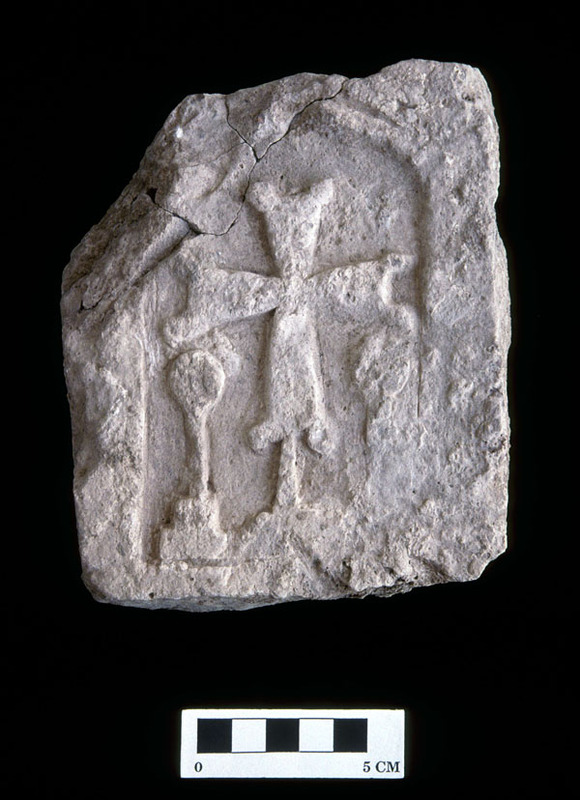 The panel discovered by Hadar resembles a Medieval Khatchkar, Armenian stone cross, used as a memorial on a grave. 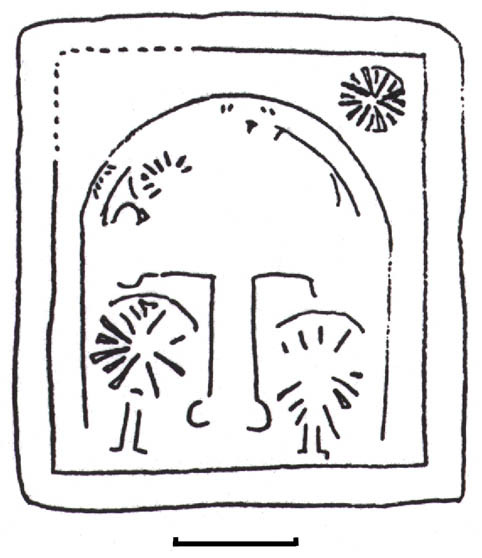 Drawing by David Hanlon of the molded stucco panel discovered during cultivation of the site by Hadar Seloo. The fragments were discovered near the south side of the monastery church, near the crypt. 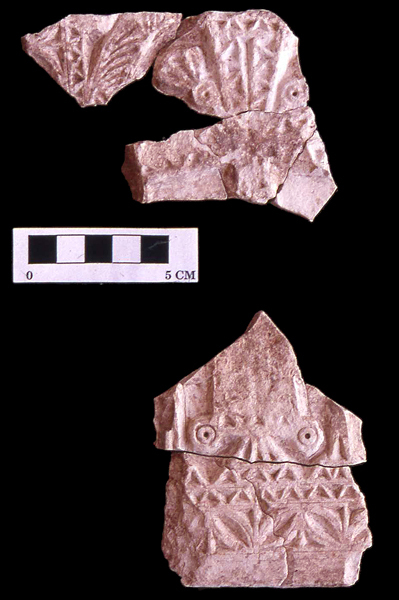 The majority of the pieces were found in 1997. One fragment was discovered in situ during 1998 in Area 9, Square 24, Locus 48. Scale is 5 cm. Copies of the monastery art discovered at Tuneinir have been shared with the Syriac Orthodox and Church of the East communities in Hasake. The recently constructed Monastery of Mary (west of Hasake) has incorporated copies of Tuneinir monastic art into the new monastery. Drawing by David Hanlon of the headstone of the abbot's grave. Area 9, Sq. 20, locus 08. Discovered during the 2001 season at Tell Tuneinir, Syria. Scale is 5 cm. 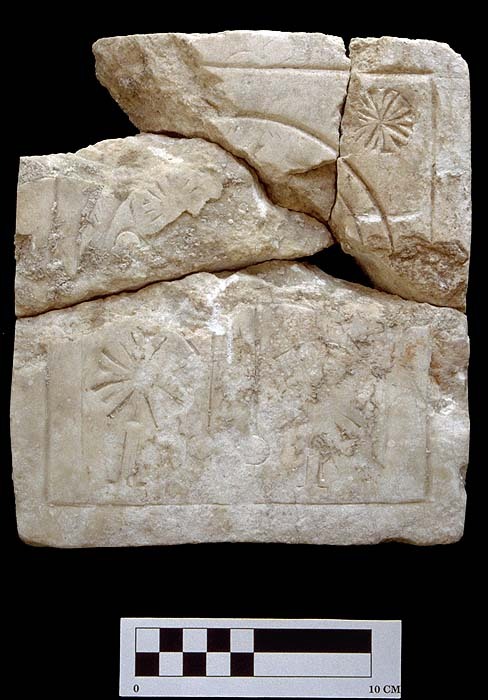 Broken fragments of a molded stucco footstone associated with the burial of a bishop or abbot in the center of the main entrance of the monastery. Discovered by Mary at the foot end (east end) of the grave, Area 9, Square 31, locus 004 during 2001. Stone registry number S 1350. Professor MIchael Fuller interprets the image on the footstone as the Cross of Christ with a piece of fabric blown around its base. This would apply to the story of the resurrection of Christ and the empty burial shroud left behind in His tomb. The imagery is of the cross and resurrection. 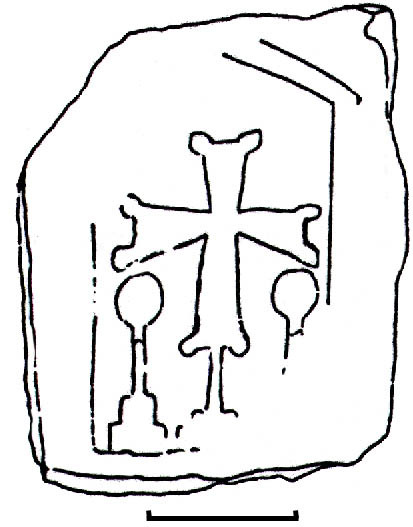 Drawing by David Hanlon of the footstone of the abbot's grave. Area 9, Sq. 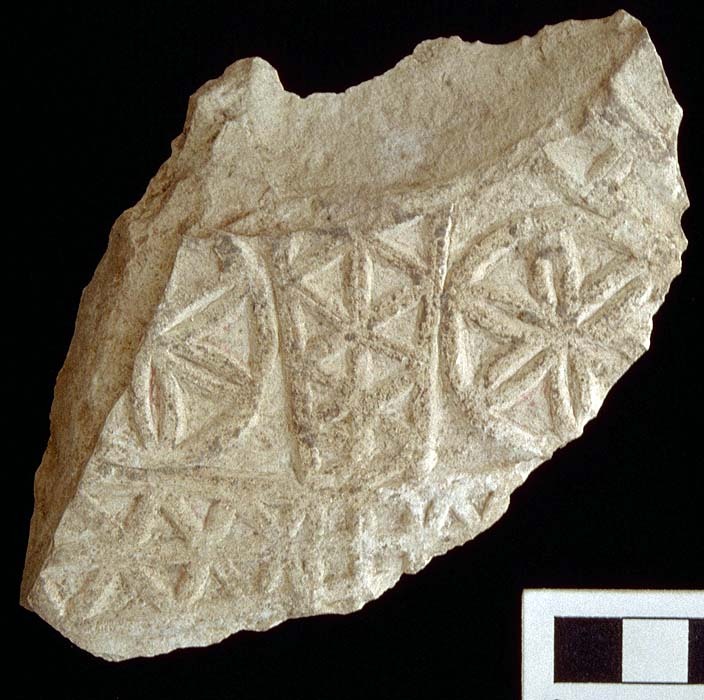 31, Locus 04, Discovered during the 2001 season at Tell Tuneinir, Syria. Scale is 5 cm. 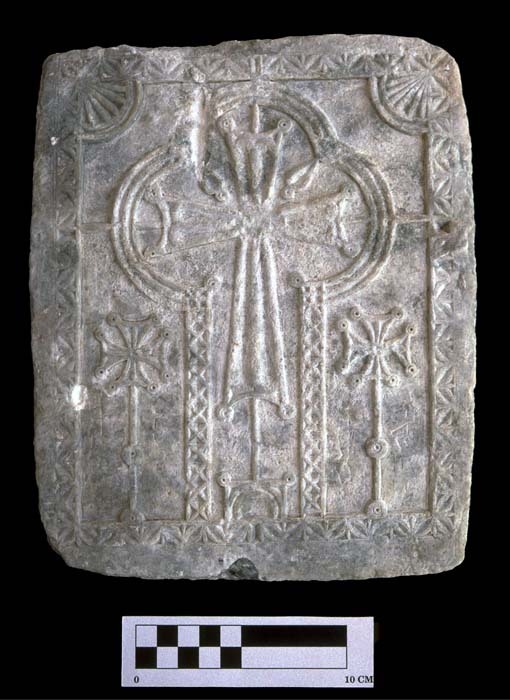 Heavily worn marble panel with the design of a cross with a rosette hovering above ear arm. 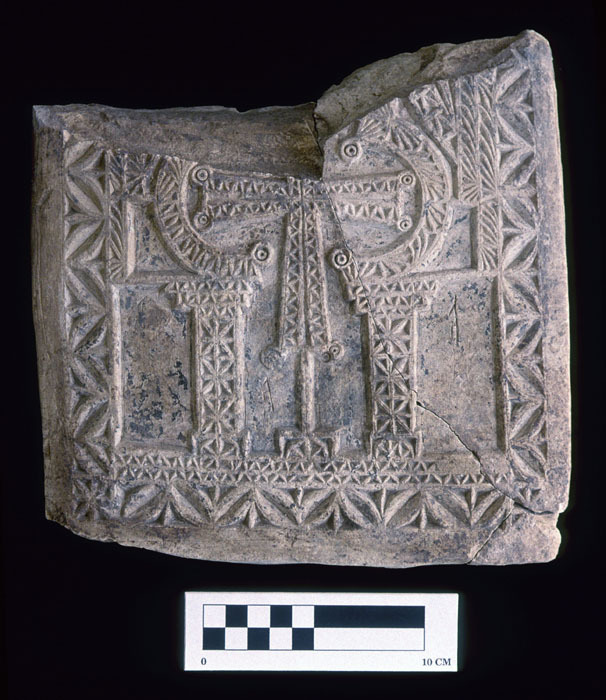 The amount of wear suggests that this art object was made during the Byzantine or Umayyad Period (in contrast to the unweathered limestone panels such as the one at the head of the grave in Square 31). This artifact was discovered by Robert McWhorter along the side of the Beth Kadeshy in Area 9, Square 26, locus 19 during 1999. It was assigned stone registry number S 1146). Drawing by David Hanlon of a piece of a worn marble panel decorated with a cross, rosette, and spirit symbol. Discovered during 1999 in Area 9, Square 26, locus 19. It measures 17 cm in length, 16.5 cm in width and 4.6 cm in thickness. Weight is approximately 1.8 kilograms. Scale is 5 cm. 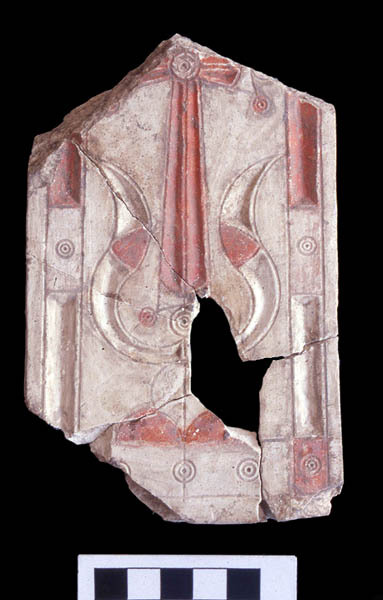 One of the most fascinating decorative panels from the monastery at Tuneinir is a broken and eroded plastic piece showing a forked-arm cross with two balloon-like objects on either side of the cross. Professor Michael Fuller believes that the forked arm cross stressed the believe in two natures of Christ: His Divine Nature and His Human Nature. The balloon-like objects are interpretred by Professor Fuller as the only way that the monastery artists could represent the two figures who are often portrayed at the foot of the cross: Mary of Magdalene and the Apostle John. Most Christian art would show human images at the foot of the cross, but this is art made by monks that were very influenced by the iconoclasts ideology. The balloon-like objects are the souls of Mary and John. This panel was discovered by Robert McWhorter along the outer wall of the Beth Kadeshy. It was discovered during 2000 in Area 9, Square 13, locus 02 and assigned stone registry number S 1295. 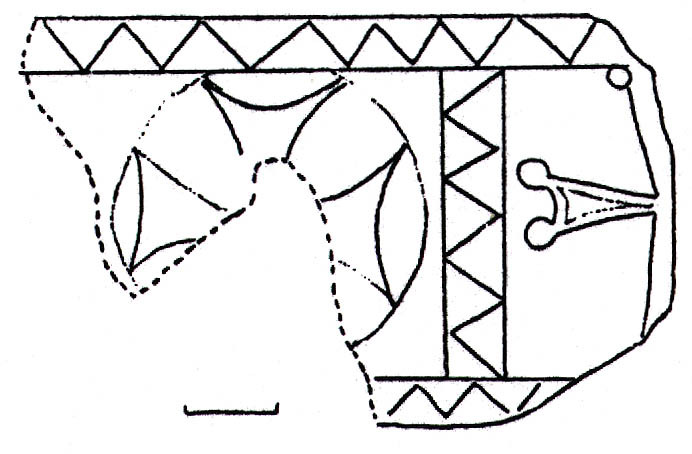 Drawing by David Hanlon of the stucco panel with a central cross and two spirit designs. Discovered during 2000 in Area 9, Square 13, locus 02. Scale is 5 cm. 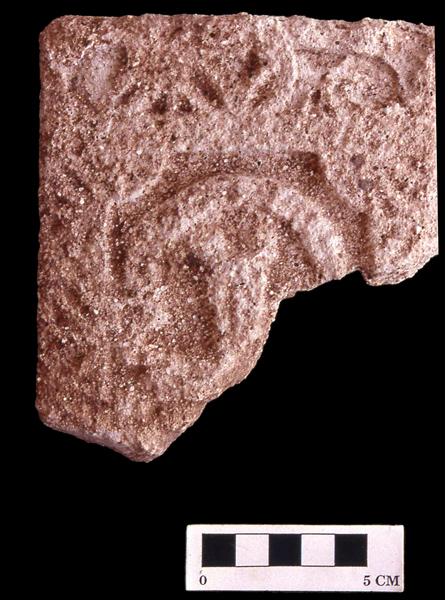 Clay Votive Plaque discovered broken in pieces in the area of the monastery kitchen. The plaque is decorated with the design of the forked arm cross with a cross in each quadrant of the forked arm cross. This was discovered during 1997 in Area 9, Square 56, locus 02 and assigned pottery registration number 6065. The red ware pottery is very typical of the local pottery tradition at Tuneinir. The three holes at the top of the plaque suggest that it was to be suspended or attached to either the mudbrick wall, a wood panel, or cloth. 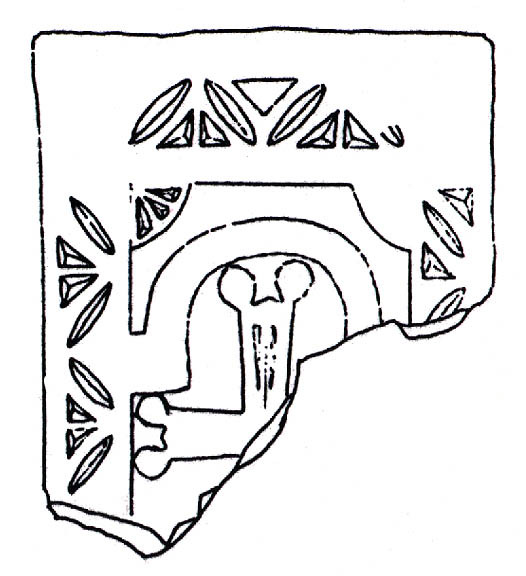 Drawing by Neathery Batsell Fuler of the broken ceramic plaque found in the kitchen area, north of the monastic church. Discovered during the 1997 field season in Area 9, Square 56, Locus 02. It measures 14.5 cm in length, 11.2 cm in width and 1.0 cm in thickness. 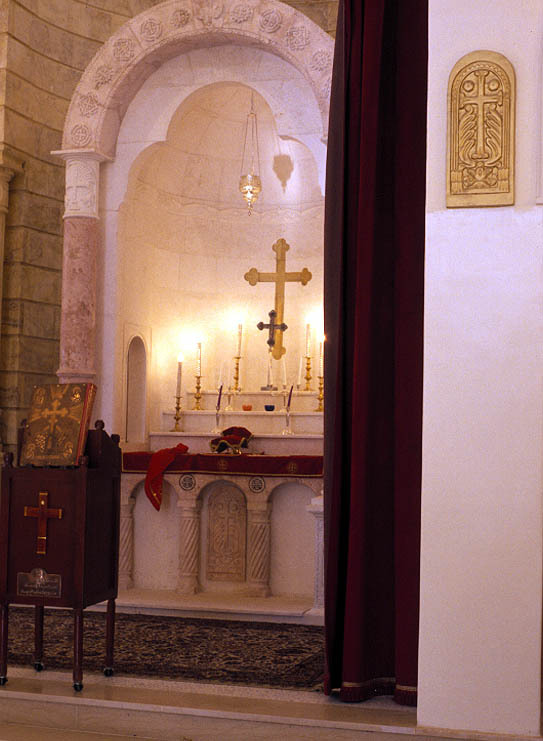 The cross-and-crosslets motif resembles the Jerusalem cross; the frame around the central motif resembles the doorframe motif used in the marble relief panels from Area 9. 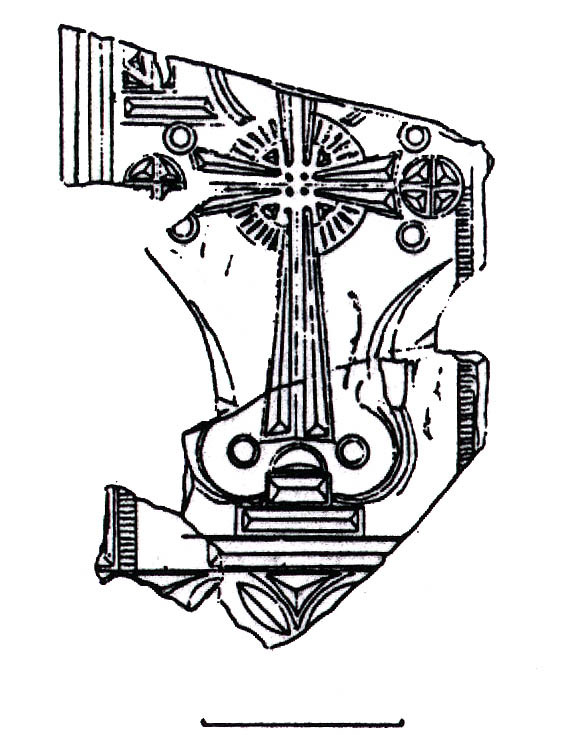 The breakage pattern of the plaque appears was not accidental but represented intentional snapping the body and arms of the cross. The iconography of the plaque probably represents Christ (the forked arm cross) and the four evangelists (Matthew, Mark, Luke and John). Broken pieces of a molded plaster with a central opening suggesting that it may have functioned as an occulus. The monastery artists were careful avoid images of the Christ, apostles or angels. 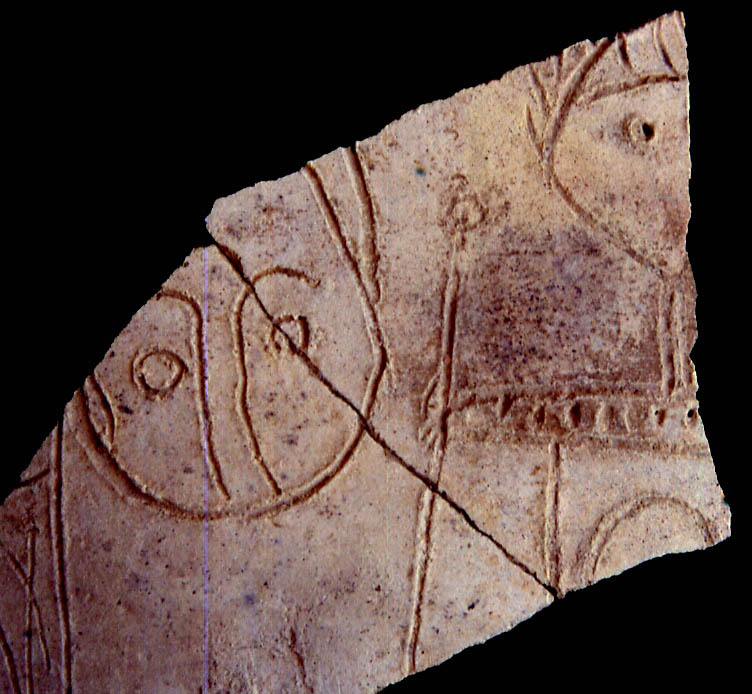 The only image close to a human form was found incised on a broken body sherd in Square 25, locus 15. 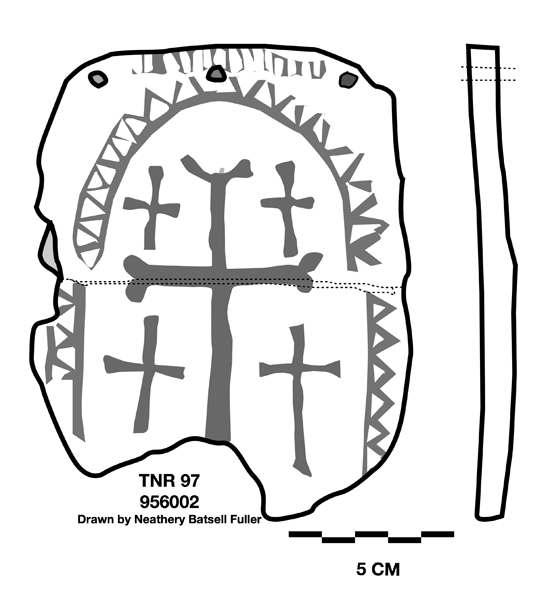 Drawing by David Hanlon of two fragments of a broken stone panel that were found over two excavation seasons. One fragment from Area 9, Square 22, Locus 11 (2001 season) and the other from Area 9, Square 44, Locus 16 (1998 season). Scale is 5 cm. 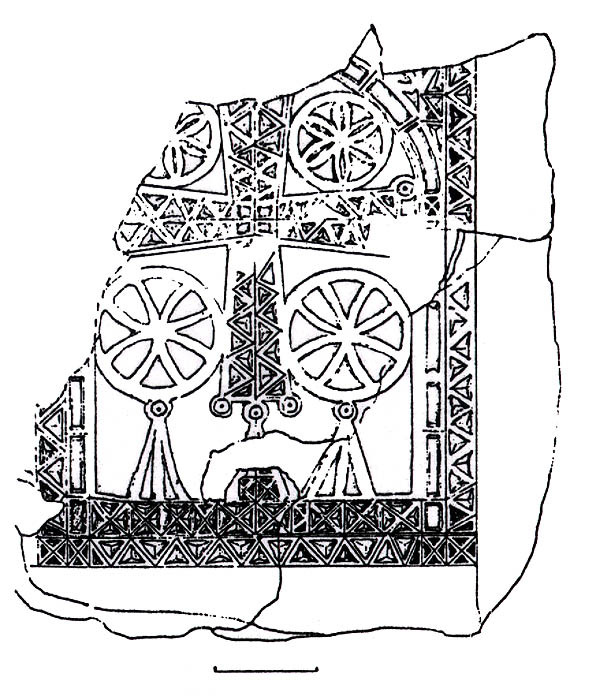 Drawing by David Hanlon of a piece of stucco with fragments of two crosses. Discovered during 1998 in Area 9, Square 34, locus 09. Scale is 5 cm. Photograph by David Hanlon of a badly worn and damaged marble panel. The panel is decorated with a central cross and smaller crosses. Discovered during 1998 in Area 9, Squares 37 and 45. 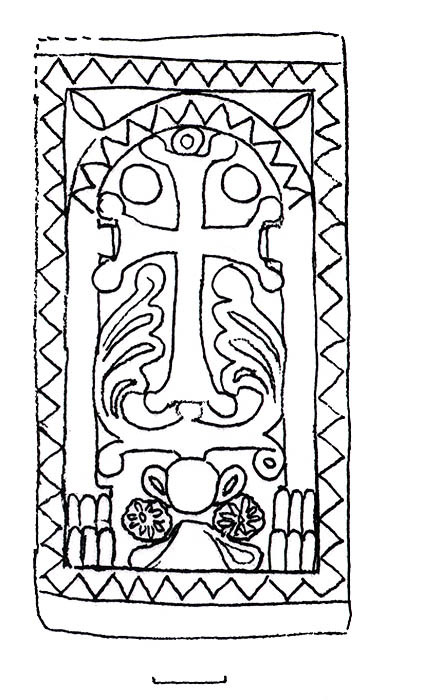 Drawing by David Hanlon of a worn marble panel decorated with a central cross and smaller crosses. Discovered during 1998 in Area 9, Squares 37 and 45. Scale is 5 cm. 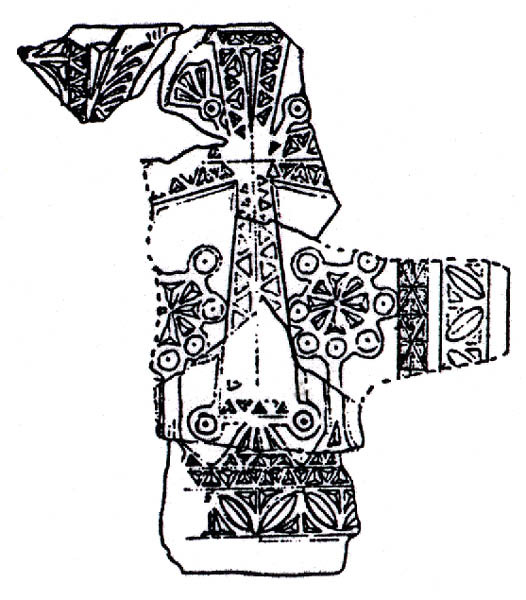 Drawing by David Hanlon of the fragments of a delicatedly carved panel. Discovered during 1998 in Area 9, Square 34, locus 09. Scale is 5 cm. 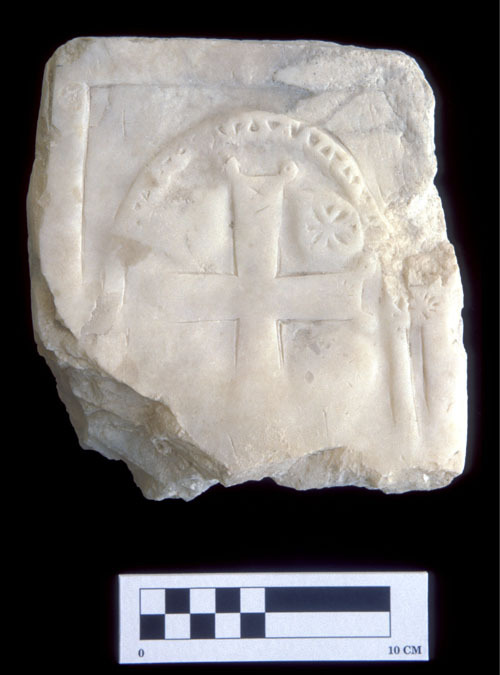 Fragment of a limestone panel decorated with a delicate central cross, and two rosettes that balance on the horizontal arms of the cross. The body of the cross is filled with rosettes. This fragment was discovered during 1998 in Area 9, Square 35, locus 19. 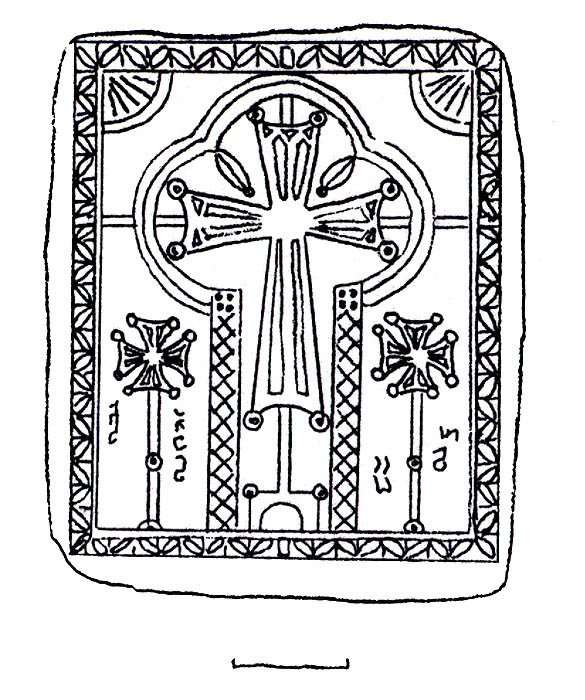 Drawing by David Hanlon of two pieces of a delicately carved stone panel with a central cross, two rosettes, and two smaller crosses. The body of the cross is filled with rosettes. Half discovered during 1998 in Area 9, Square 35, locus 19. Second half discovered during 2000 in Area 9, Square 13, Locus 06. Scale is 5 cm. 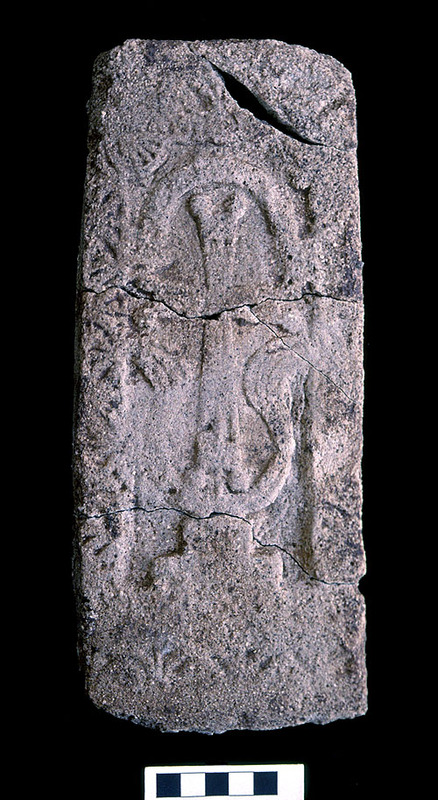 Decorated panel discovered during 2001 in Area 9, Square 31, locus 04; special object registration no. 1367. 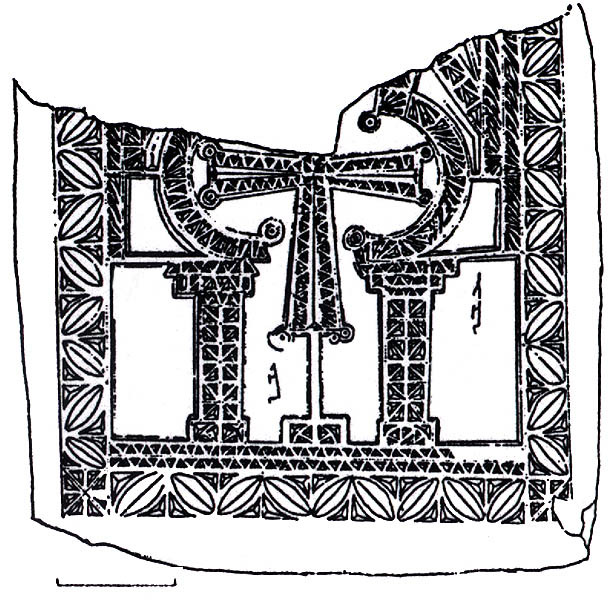 Drawing by David Hanlon of the fragments of the top half of a decorated panel. Discovered during 2001 in Area 9, Square 31, locus 04. Two fragments of a panel from Area 9, Square 22, Locus 11; registration no. 1455. 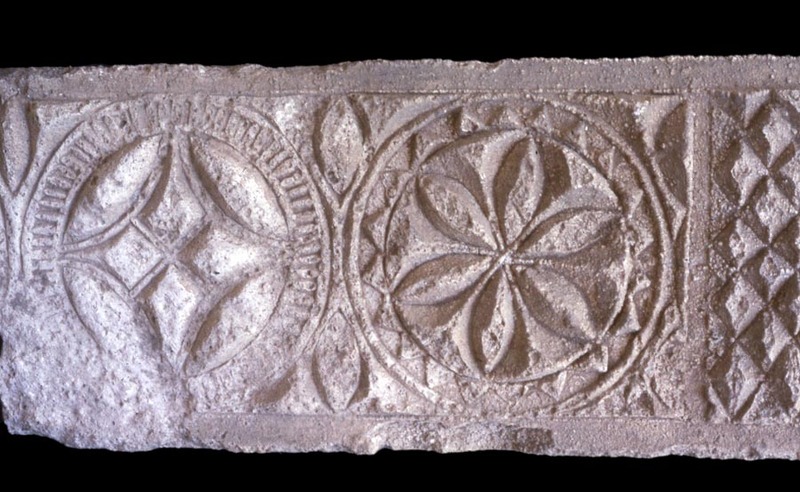 Molded stucco panel with designs of rosettes. This panel framed a niche along the south wall of the haikal. The niche was probably the place where communion wine and bread were kept. 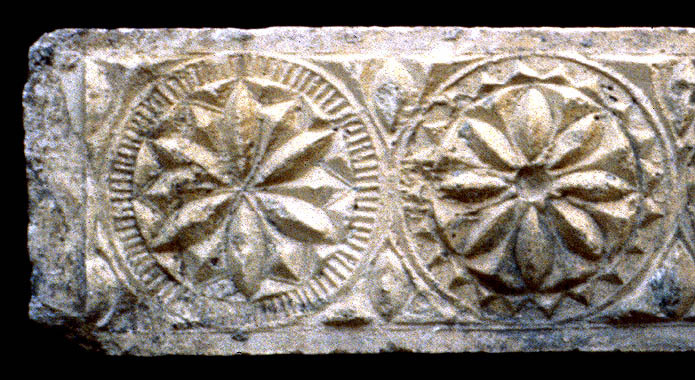 Closeup of the rosette designs on the molded plaster. 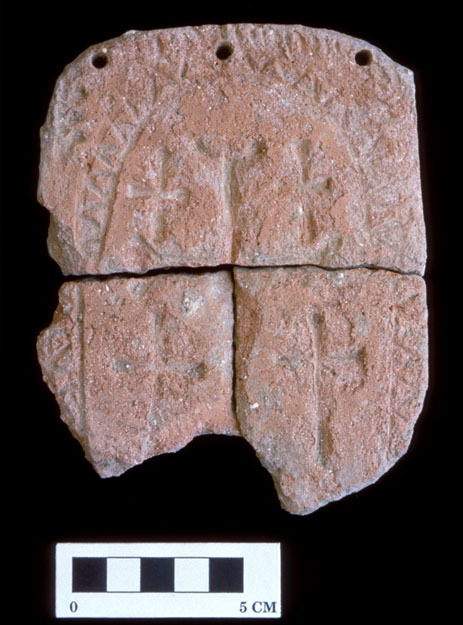 Painted cross fragment from Square 16, locus 02 (stone registry number 1162); discovered by James Walker during the 1999 field season. The surviving fragment measures 14.5 cm in length, 9.2 cm in width, and 1.1 cm thick. It weighs 284.4 grams. Drawing by David Hanlon of the painted stone panel. Half of this panel was discovered during 1994 in Area 3, Square 20, Locus 14. Half of the panel was discovered in Area 9, Square 16, Locus 02. Scale is 5 cm. Last updated 12 February 2007.